Thank you. We will get back to you here or via email. The webinar is over. Thank you for attending! This webinar aims to educate and help organizations beginning or in the midst of a GRC software RFP and implementation to understand how to deliver a successful GRC software implementation that delivers on requirements and brings value to the organization. This is a recording of a previous event. There may be references to future events, special offers and free downloads that are not available at this time. Governance, risk management, and compliance (GRC) is ultimately something an organization does and not something you buy. However, there is a range of GRC technologies and platforms available in the market to make GRC processes more efficient, effective, and agile. The challenge is navigating vendor hyperbole and finding the right GRC technology that fits your organization. The market is flooded with solutions that promise the world but either under deliver or take excessively long to implement and build out driving the project over budget with missed deadlines. The successful GRC software implementation requires a clear strategy and collaboration across the organization with defined goals, timelines, and requirements that are clearly understood. 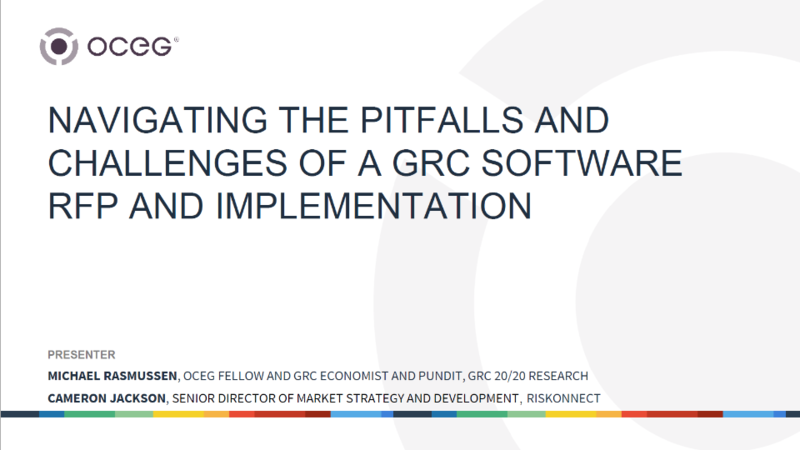 This webinar aims to educate and help organizations beginning or in the midst of a GRC software RFP and implementation to understand how to deliver a successful GRC software implementation that delivers on requirements and brings value to the organization. Please provide your email address so we can send you a link to the webinar archive. One last step before you can access the archive. I acknowledge that the sponsor of this content will receive my information from this form. A link to the archive was sent to . Make sure the email arrives in your inbox: either add "support@oceg.org" as a safe sender to your email platform, or if you use Gmail, drag our email into your Primary tab.